Even though they encompass an incredible variety of ideas, most indie games tend to work within tried and true genres, whether to subvert them, perfect them, or use them as a tool for other purposes. 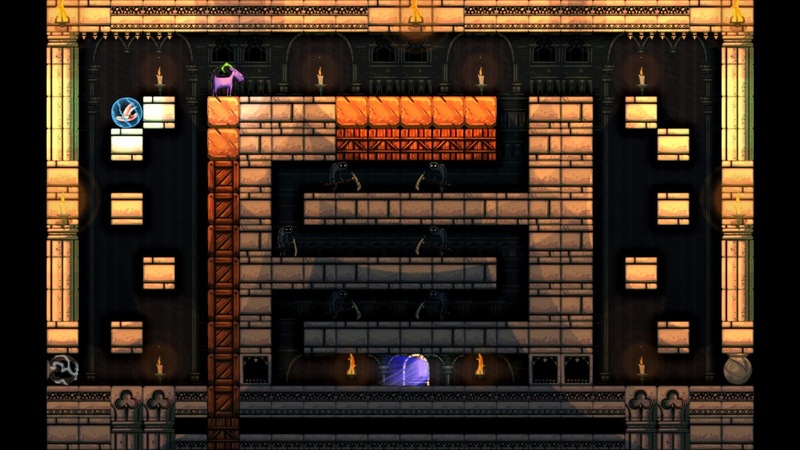 Escape Goat 2 is a puzzle game that aims for perfection, minimizing most skill-based platforming while focusing on logic and timing puzzles. It also stars a purple goat and a mystical mouse, but that's not especially relevant. This game isn't a joke, unlike some other goat themed releases, and it deserves far more attention for its spectacular puzzle design. 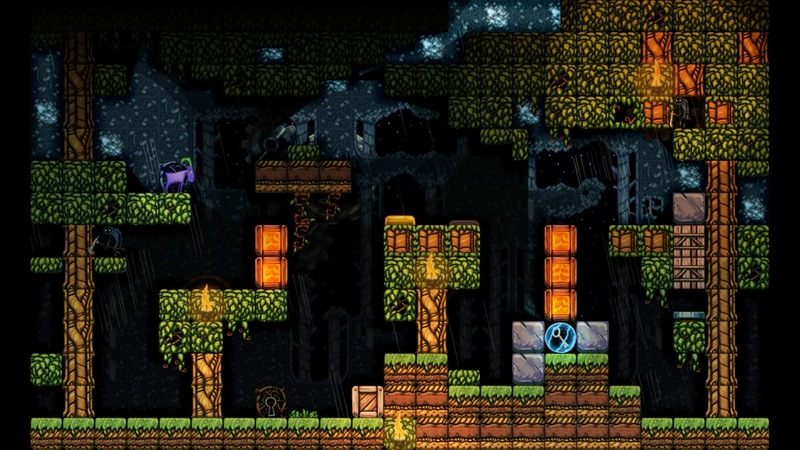 Escape Goat 2 is the sequel to a pixel graphic puzzle platformer released in 2011. The original game received acclaim for its ingenious puzzles and intuitive learning curve, and even inspired a Hey Ash, Whatcha Playin? episode, but had to struggle through Greenlight to receive a release on Steam. The sequel has gained the honor of being the first game published by beloved developer Double Fine, but still has not received as much attention as it deserves. In the first game, the titular goat was imprisoned for witchcraft and had to escape prison, while also releasing some sheep as well. For the sequel's minimal story, the dynamic goat and mouse team find themselves trapped within the mysterious Stronghold of Taragos, forced to free the sheep lured into the tower. 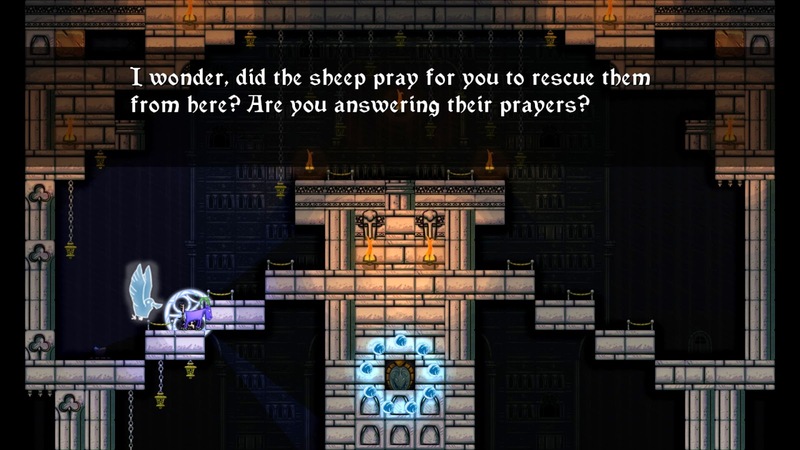 While the sheep and some ghostly denizens of the stronghold all have their own personalities, the story mostly provides some extra flavor and allows for the player's own interpretation. 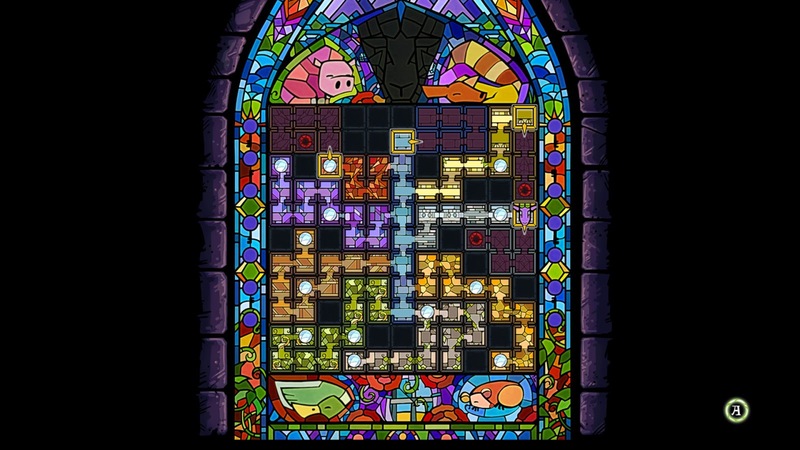 Linked by a lovely stained glass map, each level is its own contained puzzle, with each sequence of levels focused on the same puzzle theme. The environments are sized to fill the screen, making sure that all parts of the level and its solution are clearly visible. This is important, as later levels emphasize chain reactions of chaos that must be carefully timed. One wrong jump or puzzle block push can make a puzzle unsolvable, something that can be slightly frustrating during longer solutions. 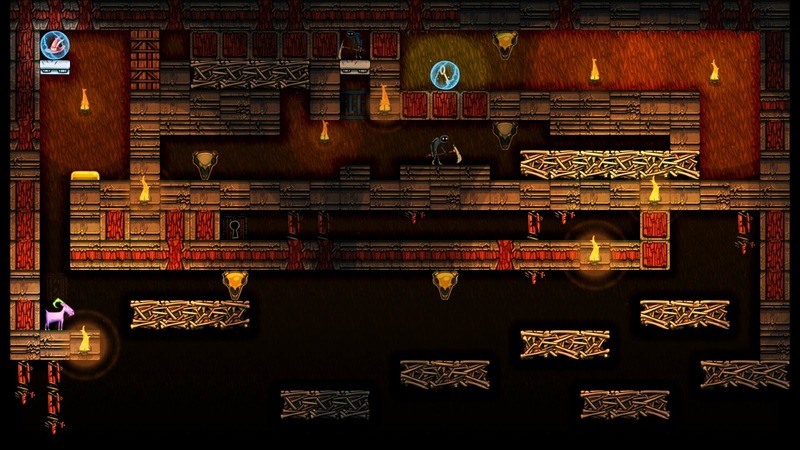 However, most levels are quickly completed once the solution is discovered, and restarting the level after deaths, intentional or otherwise, takes only a second. Deaths will come frequently as the challenges increase. By the time of my first escape from the stronghold, the goat had perished 385 times over the course of 4 and a half hours of play. Thankfully, these deaths rarely felt cheap or unnecessary, and were usually voluntary resets to a level made unsolvable. Controls and jumping feel precise, with a forgiving double jump and an extremely goat-like headbutt as the primary skills for navigating environments. The other main puzzle solving tool is the mouse, which can be placed to hold down switches or tossed to crawl along and through inaccessible places. A few levels also include hats that allow the mouse to teleport, turn into a block, or charge through the air. The mouse cannot be controlled directly, and follows its initial path before automatically turning around at certain obstacles until recalled or killed. This can prove frustrating at times, as initial placement of the mouse can sometimes feel finicky compared to the precise jumps of the goat. However, most puzzles give just enough leeway that perfection isn't necessary for success, and the extra complexity the mouse provides really opens up the game to many unique solutions. There's little guidance or obvious tutorials during the game, but the game's pacing and difficulty curve is superb. Puzzles increase in complexity and introduce new mechanics at just the right pace to stay interesting while never becoming frustrating. The answer to almost every level is a logical progression of tactics used in earlier levels, and only the last few sections introduce a challenge that can prove confusing at first. For those who want some extra difficulty, there are also a decent amount of hidden levels with their own advanced trials. 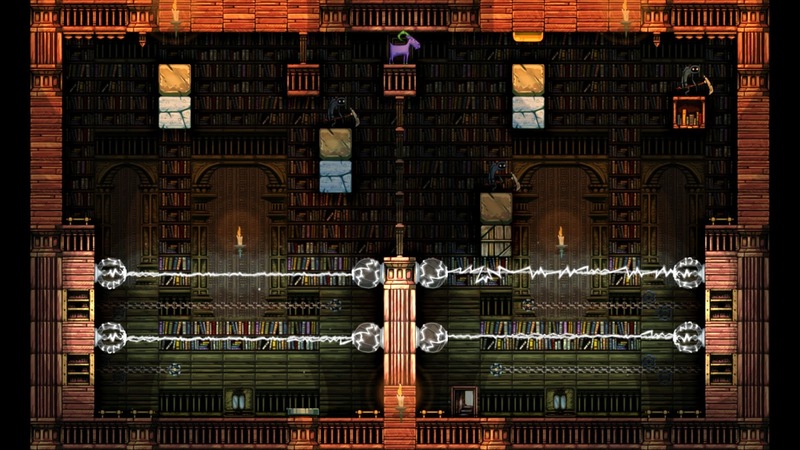 While non-essential for a puzzle game, Escape Goat 2's sound and visual design are a wonderful surprise. Compared to the functional pixel art of the first game, the sequel's hand-drawn aesthetic is gorgeous, with a definite storybook influence. The music is also spectacular, featuring electronic music with medieval influences that only heighten the game's mystery. 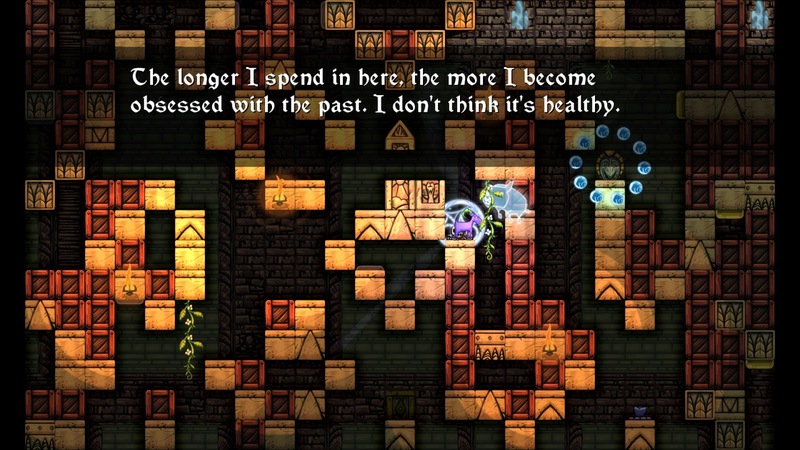 Escape Goat 2 is a great puzzle game that lasts just long enough to be satisfying. There's no better feeling than pulling off an elaborate solution to a level while navigating the controlled chaos. This game is well worth the $9.99 asking price, and the soundtrack is worth picking up as well.